The Asset Management Council, through AMBoK, has developed a number of models that illustrate and describe asset management. Models may only be reproduced with the consent of the Asset Management Council Ltd. The Asset Management Concept Model documents the basis of asset management. The model’s intent is to serve as a conceptual framework from which the foundational elements of asset management can be identified, documented and implemented. The Asset Management Concept Model consists of four key principles, connected by a set of processes within which a Plan Do Check Act approach is implemented. These are encased by a ‘Stakeholder Circle’. A management system is a set of interrelated or interacting elements of an organisation to establish policies, objectives and processes to achieve organisational objectives. A management system can address a single discipline or several disciplines. In small organisations there may not be a formally documented system. However, the larger the organisation, the more likely it is that there are written instructions about how these policies and processes. This ensures that nothing is omitted and that all are clear about who needs to do what, when and how. The Asset Management System Model defines the parts of a management system for the management of assets (that is, the Asset Management System) and the relationship between these parts. In addition to defining those relationships, the Asset Management System Model depicts the linkage between the stakeholders’ needs, the organisational leadership and culture and the organisational objectives to the asset management objectives. The Capability Delivery Model schematically presents processes that may be used in part or entirety to deliver the stated outputs of the organisation. develop and implement an asset capability (solutions) for an organisation. the relevant ISO and international engineering and financial management standards relevant to the processes associated with the management of assets. 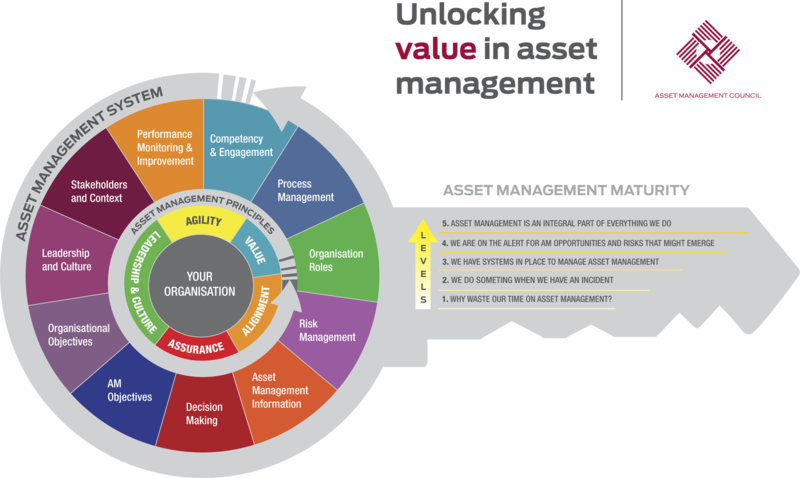 Asset management maturity is defined by the Asset Management Council as 'the ability of an organisation to foresee and respond to its environment through the management of its assets, while continuing to meet the needs of its stakeholders’. Asset management maturity requires that an organisation deliver outcomes such as customer service, profit, safety and assurance, with the assigned resources and within the requisite delivery period. Asset management maturity is dynamic and should be able to respond to both the changing business environment and changing stakeholder needs in a manner that aligns with the other functions of the organisation. Asset management maturity can be considered as the extent to which asset management is aligned and integrated into an organisation. A set of Qualities that provide a description of the essential nature of asset management maturity across the whole organisation.